Hey hey hey, what’s crackalackin’? 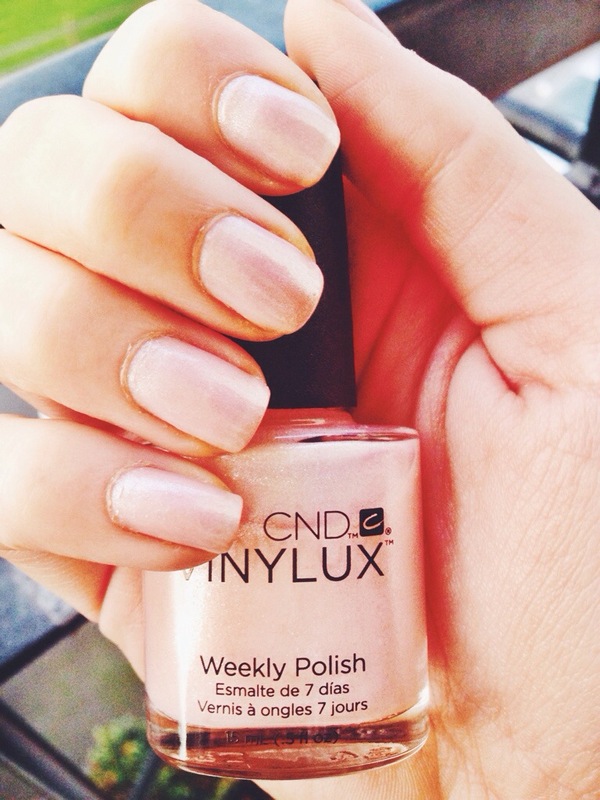 I recently bought some CND Vinylux polishes off eBay. It was an offer I couldn’t refuse: buy 5, and get a free topcoat. Sold! I already have lots of CND Shellac polishes, which last 2 weeks and need to be cured with a special lamp. The difference with this polish is that it’s supposed to be a weekly polish, painted on as you would normally. It doesn’t need a base coat either. Me being me spent ages picking the perfect colours to add to my collection. I chose ‘Grapefruit Sparkle’ as I’d wanted something quite subtle for a while. It’s a bit sheer, even after I applied 3 thin coats, but I still really liked how natural and pretty it looked on my nails. It applies and dries nicely, with a smooth, shiny finish. I didn’t give it much of a chance to last, as I impatiently wanted to try out my other colours. It removed fairly easily with nail polish remover containing acetone though! Use a cuticle softener and then push back your cuticles to ensure full coverage of the nail plate. Getting polish on your cuticles will ruin the look, but you want to get as close as you can for a professional finish. Mine don’t look great in this picture as I didn’t have a softener. Make sure your nails are totally clean before application. This means using a product like Scrubfresh (type it in on eBay) or acetone to get rid of dirt and grease. Your polish won’t last as long if your nails aren’t clean. Use a dehydrator to get rid of oil. This is optional but I think it helps. Carefully lip over the free edge of your nail to seal the polish and make it last longer. Use a cuticle oil when your nails are dry to nourish your skin and nails. It makes nails look nice and shiny too! If you haven’t used these tips before, you should try them. You’ll notice a huge improvement in the way your nails look and last. Trust me, I’m a beauty therapist! I’ll be regaling you with tales of more Vinylux nail adventures in the near future. Toodlepip!